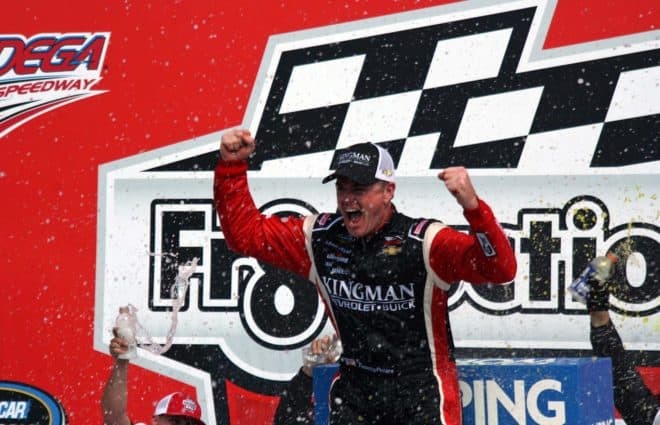 From 2009 to 2016, Timothy Peters was a fixture in the Camping World Truck Series. The Danville, Va. native won 10 races and finished in the top 10 in points every year during that timeframe, including a runner-up points finish in 2012. Peters was also one of CWTS’ inaugural Championship 4 to compete for the title at Homestead-Miami Speedway in 2016. The future seemed bright. But just five races into the following season, owner Tom DeLoach abruptly shuttered Red Horse Racing, Peters’ team for those eight seasons, due to sponsorship troubles. Since then, Peters has served as the general manager for Nelson Motorsports, a late model stock car program that fields cars in the CARS Tour and for the weekly races at South Boston Speedway. 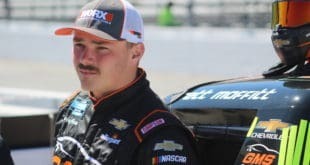 He’s only made a handful of starts in the Truck Series for MDM Motorsports, Young’s Motorsports and Ricky Benton Racing. Peters ran one race at his home track, Martinsville Speedway, for Benton and made his Monster Energy NASCAR Cup Series debut for the team at Talladega. But then he failed to qualify for his next Cup attempt and his next two Truck attempts for the team. It seemed we had seen the last of Peters in the Truck Series. That was until GMS Racing and Dalton Sargeant split up after not making the playoffs. Spencer Gallagher was slated to replace Sargeant at the Canadian Tire Motorsports Park race until he hurt his shoulder. That’s when Peters got the call. After getting a top five in Canada, Peters drove the No. 25 truck for two additional races — the final one resulted in a dramatic last-lap pass on Noah Gragson to win at Talladega Superspeedway. Frontstretch’s Michael Massie caught up with Peters the day before his return to CWTS Victory Lane. Michael Massie, Frontstretch: How did this whole GMS Racing deal come together for a couple races? I know Spencer Gallagher got hurt. Timothy Peters: Obviously, we hate it that Spencer got hurt with his shoulder right before Canada. [GMS President] Mike Beam gave me a call and asked me if I could come and fill in. I said absolutely. Getting to Canada was a chore within itself, but I’m very thankful for Sara, my wife — my passport was expired. We went to Atlanta that night, expedited my passport that morning and got on a plane and headed for Canada and were able to run Canada and [Las] Vegas [Motor Speedway], and here we are at Talladega. Massie: What’s it been like to hit a couple weeks in a row in the Truck Series? Peters: It’s been great. It rejuvenated a lot for me, being back, to getting great equipment, competitive equipment, knowing that you go to the racetrack and have a shot to win. To compete for wins again is pretty cool. Massie: GMS announced that Tyler Dippel and Sheldon Creed are going to finish the year out. Are you going to do any more races for them this year? Peters: This is my last one. I’m very thankful for the races I’ve gotten to run. It’s a great organization, and I’ve become friends with, not only the guys on this team, but everyone in the shop. Massie: Are you going to do any more Truck races this year for anyone else? Peters: Not that I’m aware of. Massie: So not even Martinsville? Peters: Nope. I’m gonna come hang out though. Hang with these guys and cheer Tyler [Dippel] on. Massie: You were with Ricky Benton earlier this season. What happened to that deal? Did failing to qualify for those races set the team back? Peters: Not really. Those guys really worked hard. It wasn’t from a lack of effort. Ricky gave me a shot at Martinsville earlier this year with a truck. And we went and we finished seventh. And then, had an opportunity to come [to Talladega] in the Cup car in April and we ran 23rd. So no, [failing to qualify] definitely didn’t help. Was it a setback? I don’t know if you call it that or not. But when the opportunity came up to come and drive these races, I wanted to focus on these races with GMS and not really go back and forth. In my eyes, I felt like that was a conflict, so I just chose to say “thank you” and we parted friends. Massie: Talk about that Cup race a little bit. Did you ever think in the past couple years that you would get to run a Cup race? And then, just talk about the experience of racing with those guys at the top level. Peters: It definitely was a big one. The first half of the race, I got us kind of in a box, but toward the end, we raced. That was a good experience gainer for me. I looked at it as those cars are way different, the addition to the spoiler for speedway racing now wasn’t added then. No ride-height rule, the cars were a handful. Learned a lot, for sure, that’s helping me for this weekend. Massie: 2016, you were part of that original Championship 4, probably one of the highest moments of your career. And then, the next season, Red Horse has to shut down. Is there a better example of the highs and lows of racing? And how does someone get through something like that? Peters: It’s never easy, you know. But at the end of the day, I had a 10-year run with Red Horse Racing, and that’s more than most can say as far as teams that they’ve been associated with. I’m grateful for the wins and the opportunity that I had and the friendships I have. I hate it that it happened, but definitely understand the reasoning behind it. Tom [DeLoach] and I are still great friends today. It’s just a business decision that no businessman really likes to make, and I just hate it. Massie: Since that happened, you’ve become the general manager at Nelson Motorsports. Talk a little about what you do there. Peters: Our late model program, I’m very proud of what goes on with that. We’ve been very competitive since the inception of Nelson Motorsports. It’s not just due to one person, it’s everybody. Marcus Richmond is a big component of that, David Triplett is a component of that. All those guys work so hard and put those machines together, it makes it a lot easier for when you have the young guys like Bobby McCarty and Brandon Pierce show up and strap in. Massie: Do you think Nelson ever has any plans to branch out? Peters: We’ve been racing the CARS Tour this year with Bobby McCarty and Brandon Pierce. We’ve branched out some as far as running a different series, not running the same track every weekend. And it’s been good for Bobby and Brandon for the experience that they’ve gained. Massie: Do you have any plans for next year? Peters: Nothing planned yet. Obviously, this sport takes money. [I’m] looking for it every day. I really enjoy the Truck Series. I would really like to come and be with GMS. But at the end of the day, I’m personally working to try to figure out a way to come back into the series because I have a lot of great friends here, a lot of great memories and I don’t feel like that I’m done quite yet. Massie: If money didn’t drive NASCAR, it was purely on talent and other things, then how high do you think you would soar? Peters: Obviously, the sky’s the limit on that. I feel like it would soar into the Cup Series, I feel like, but God has a different plan for me. I’m thankful for the experience and the knowledge that I’ve gained throughout the Truck Series, and I’m perfectly fine staying right where I’m at.